Say Goodbye to Burnt and Undercooked Food!! With AMIR Digital Food Thermometer, no more guess work and spoilt meals. You have no need to slice your chicken open or leave huge puncture marks in your food any more, easy to achieve your perfect doneness every time! Let's face it - who wants to guess whether their meat selection for dinner is ready?! NOT ME! Perfect Doneness: The Digital Food Thermometer help you to achieve Your Perfect Doneness every time and say goodbye to burnt and undercooked Food . It's easy to use, accurate and priced right. The wide temperature range of -50℃ to 300℃ (-58°F to 572°F) makes these utensils the best for use. Please do not hang the handle on the side of pan, barbecue grill. Please do not put this product inside the roaster. Do not put the products into the oven. ✅【Instant Read】 - AMIR instant read thermometer with 4 - 7 second digital readout. With an easy to read electronic LCD display, giving you accurate temperature results in seconds. 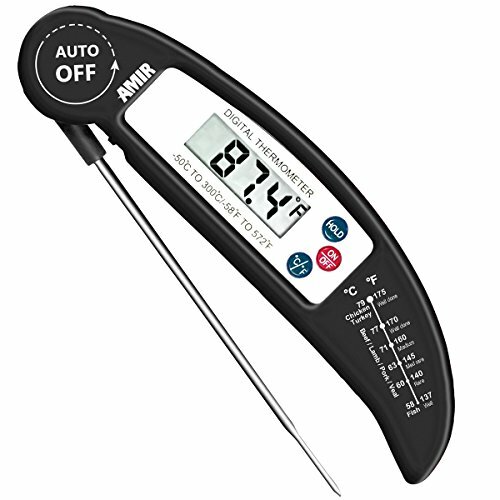 ✅【ACCURATE】 - The high precision temperature sensor, accurate to ±1°F (between -4°F to 392°F), ensures you can grill meat to your perfect doneness knowing it wont be under cooked or burnt. You won't get this level of accuracy with infrared laser gun thermometers. ✅【°F/°C BUTTON】 - The wide temperature range of -50°C to 300°C(-58°F to 572°F) makes the digital bbq thermometer the best for use when grilling on your gas bbq or turkey fryer, making candy, using hot oil to deep fry, brewing beer and wine and even making cheese and bread. ✅【HOLD BUTTON】 - Before withdrawing probe, push "HOLD". The meat thermometer will hold the temperature reading until pressed again. ✅【AUTO ON/OFF】 - Internal collapsible folding tapered probe with auto on and off; Perfect for meat, liquid, food, candy tempering in kitchen and outdoor cooking.